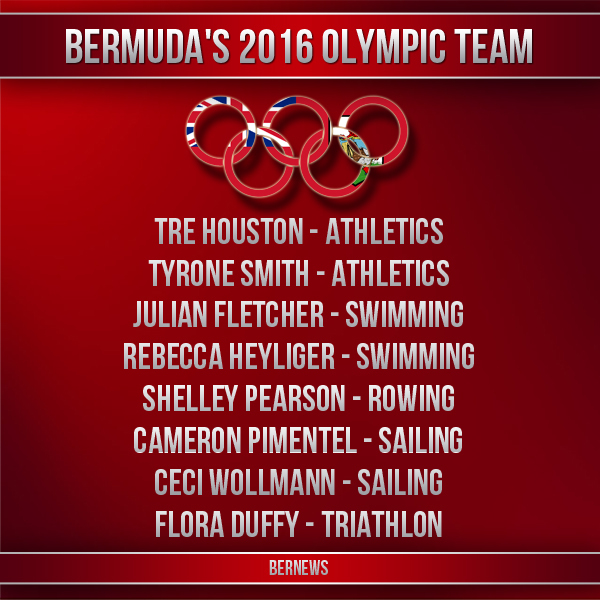 Is this the year Bermuda claims its second Olympic medal? Two Bermudians have odds placed on them to stand on the podium at the 2016 Rio Olympic Games. Triathlete Flora Duffy heads a strong Bermuda contingent that also includes medal hopeful Tyrone Smith, sailors Cameron Pimentel and Ceci Wollmann, swimmers Julian Fletcher and Rebecca Heyliger, rower Michelle Pearson and sprinter Tre Houston. The Games get underway on Friday and both Pearson and Fletcher will be early participants. Fletcher, competing in the men’s 100M breaststroke will compete this Saturday afternoon while Pearson will compete in the women’s single sculls that morning. Depending on how well she does, her event continues through Saturday, August 13. Pimentel, competing in the men’s laser, and Wollmann, sailing in the women’s laser radial class, will both do 10 races over five days starting on Monday, August 8 through Saturday, August 13. It is the first Olympics for both, and Bermuda could see a couple of top 10 finishes in individual races. Heyliger will compete in the women’s 50m free in front of her parents on Friday, August 12. The former USC Trojans swim captain is competing in her first Olympics. Sprinter Tre Houston is grateful to also be competing in his first Games after the heartbreak of not making London four years ago. He will lace up for the 200m, Bermuda’s first 200m competitor since National Coach Troy Douglas suited up at the 1996 Atlanta Games, on Tuesday, August 16. This is long jumper Tyrone Smith’s third Olympics. He has 20-1 odds in some betting shops of making the podium. Smith made the finals in London and will compete on Friday, August 12 in the qualifiers. And, if as expected, compete in the finals the next day. But the best could be saved for last as three-time Olympian Duffy is a solid medal choice when the women’s triathlon splashes into the water on Saturday, August 20. Duffy has been fabulous on the women’s tour this year finishing 4th, 4th, 3rd, 2nd and 1st in her last five races, getting better with each event. Most odds makers have her from 6-1 to 8-1 win the gold medal with her being 4.5-1 to win any medal. Duffy is currently the number one ranked woman in the world in triathlon but many prognosticators are predicting American Gwen Jorgensen to win gold but with Non Stanford, defending champ Nicola Spirig and Andrea Hewitt, Vicky Holland, Helen Jenkins in the mix. Just how strong are her chances? USA Today predicts Duffy will win the silver while Sports Illustrated has her down for the bronze. One thing can be certain, two Saturday’s from now, nearly every eye in Bermuda will be on her to see if she can beat the odds and bring home a medal. Good luck Bermuda team……we are proud of you all. Wish you all the best BDA!!! Proud of you all!! Don’t bring back the virus…just medals! Wow, we have a Bermuda Rower in the Olympics. Love it when we do well at different sports on the international stage ! Swimming and sailing in raw untreated sewage, sounds like fun. I would love to wish all my Bermudians so much Love, Prayers and Best Wishes Was great seeing you all early Saturday morning UK time. Bring the best and you’ll do your very best.